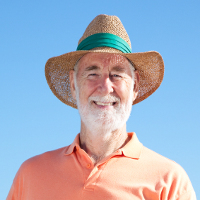 Eric is a 60 year old who has retired early due to worsening cardiac failure. He still manages to remain independent with all activities of daily living (ADL) by using various equipment and learning energy conservation techniques. Because of continued tiredness, shortness of breath (especially during physical exertion), oedema and swollen legs. Eric now gets around with a walking stick indoors and outdoors, however outdoor mobility has become increasingly difficult. Eric lives in a three bedroom semi detached house with level access to the garage at the side of the property. There is a 2" inch threshold at the front door of the house, leading into the hallway. His wife drive him around as he no longer able to drive himself. Currently Eric is at risk of losing independence in getting out and about. He likes to visit his mother and get out fishing with his friends which he particularly enjoys. He also attends a wellness centre for an exercise class. Eric was planning to buy a scooter from Argos but before he bought it he decided to check with his Social Services Occupational Therapist. She advised him to visit his local Mobility Centre for an assessment. At the Mobility Centre, they assessed gave him advice about suitable features on a scooters to suit him and suggestions on any adaptations or accessories he may need. It was recommended that a class 2 scooter with three wheels would be suitable to meet Eric's needs. This type of scooter has a tight turning circle which is suitable for indoor use. The swivel seat will enable easier transfers, in the basket he can carry light items and Eric's oxygen cylinder can also be attached to it. He was advised about the risks to take into consideration when using his oxygen cylinder in the community. The assessor recommended that he think about how to maintain and store the scooter. On reflection Eric realised he will be able to charge and store the scooter in his garage. Eric used the information given to him following his assessment to look at Living Made Easy and review the scooters available that have the required features. He will purchase his scooter from a high street store, as now he knows what features are important and why. The social services OT recommended he also purchase a portable ramp for the front access of the property. 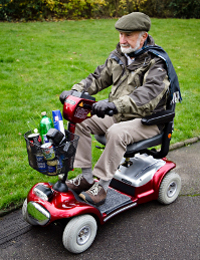 The mobility scooter will allow Eric to carry on meeting his friends to go fishing and to maintain his independence. His wife will also benefit as there will be less pressure on her time to drive him around.